Please note that the 2019 Revision Guides are not yet available for online sale. This is essential preparation for final assessment, covering the topics listed in the SACE subject outline. 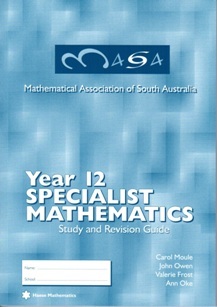 There are some questions listed by topic, sets of shorter questions and four sets of longer questions, and trial examinations based on past Specialist Mathematics papers and the SACE 2017 Exemplar Trial Exam. Fully worked solutions to all questions are include. Price includes postage throughout Australia. For orders of 5 or more booklets please contact the MASA Office to discuss delivery options.